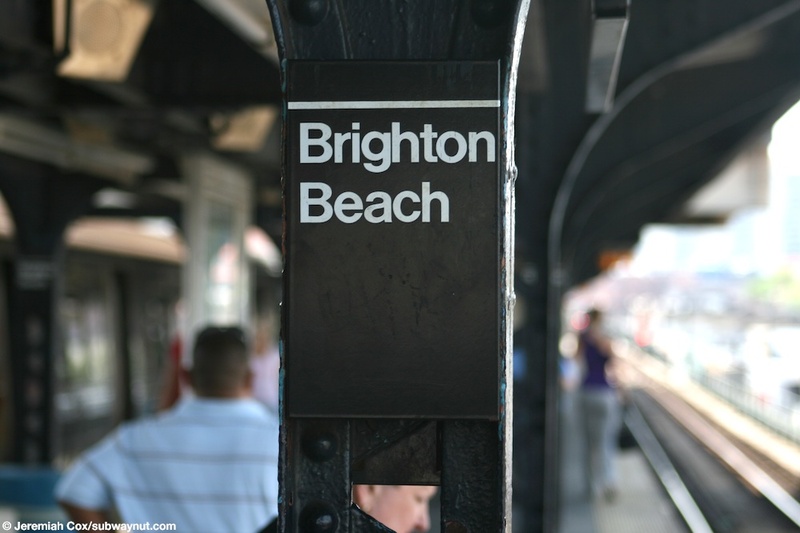 Brighton Beach is the southern terminus of Brighton Line's Express Service. 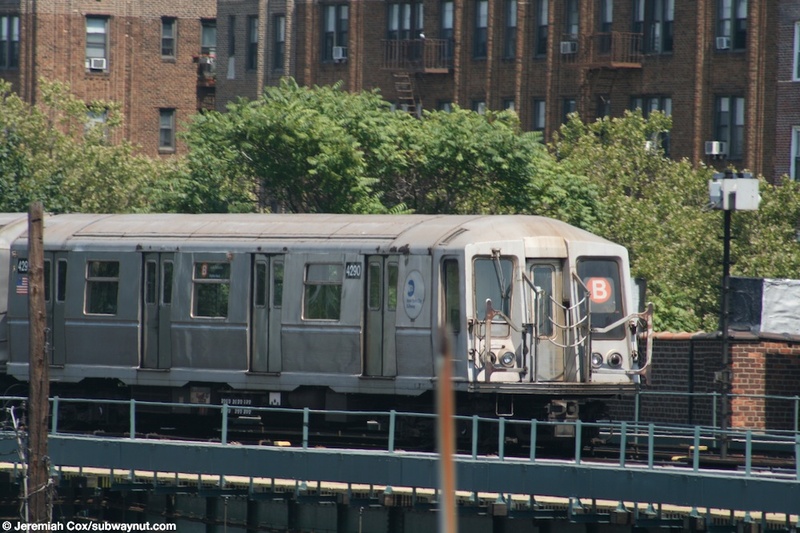 It consists of two island platforms for the four-track line. 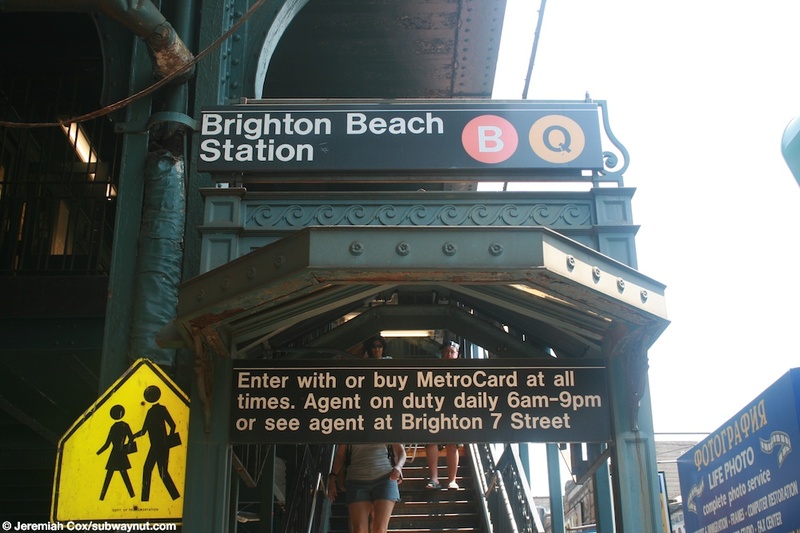 The station is one of only two Brighton Line Stations to be on a conventional NYC Subway elevated and above a major shopping street, Brighton Beach Avenue. Just east (railway north) of the station trains curve to the north to enter the Brighton Lines private Embanked and Open-Cut right-of-way that carries it all the way up to Prospect Park before going underground. 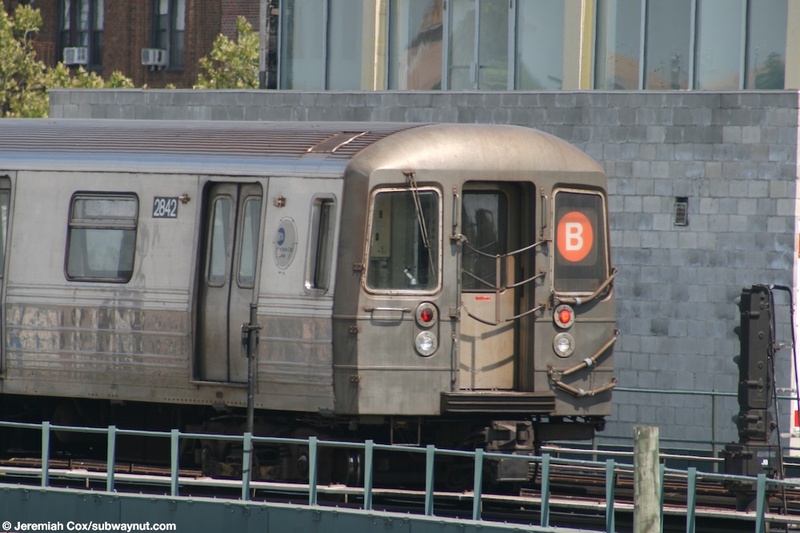 B trains when they terminate at the station must switch between their two tracks before entering the station to relay, so the next Manhattan-bound B train can be at either the Coney Island-bound or Manhattan-bound platform for through trains. 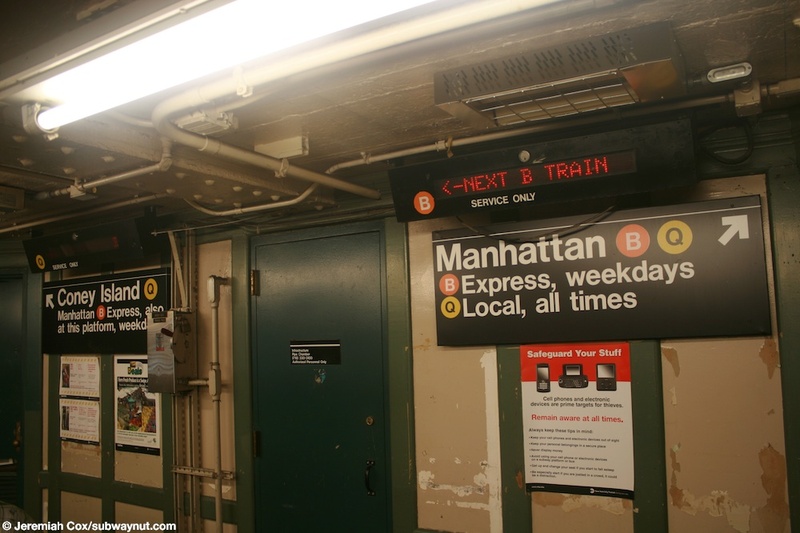 Both station houses have indicator signs telling passengers witch platform the next B train will depart from. The station has two small station houses beneath the tracks, where fare-control is for the station's two exits. At the southern end of the station is the part-time station house; it consists of a single staircase down from each platform to decent sized station house beneath the tracks where there is a bank of turnstiles and a token booth (open daily 6am to 9pm), two High Entrance/Exit Turnstiles provide 24-hour access. 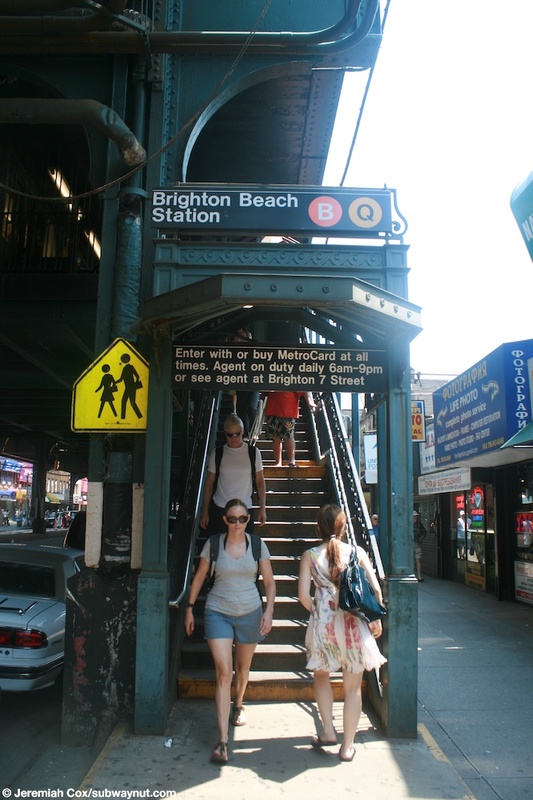 To reach street level there are twin staircases (four in total) to both sides of Brighton Beach Avenue, between Brighton 6 and 5 Streets. 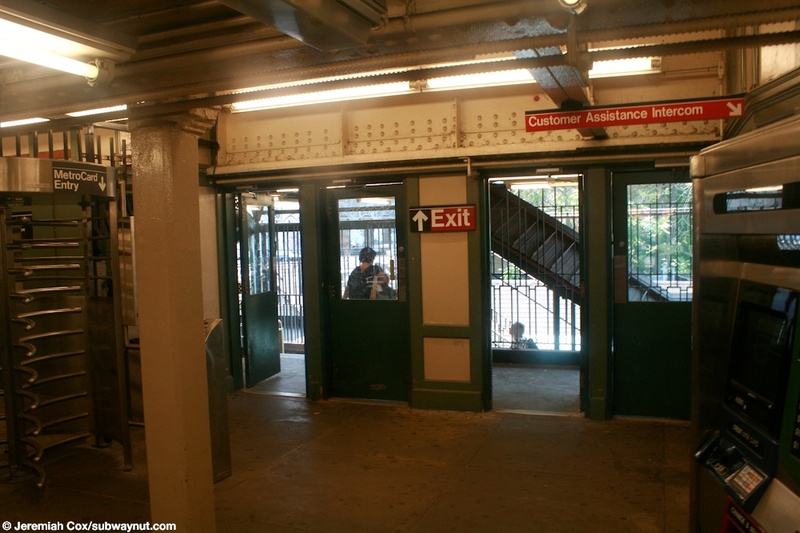 The full time fare control area is towards the northern end of the station and it consists of a pair of staircases down from each platform to a slightly larger station house area, with a real decently sized enclosed waiting area beneath the tracks. 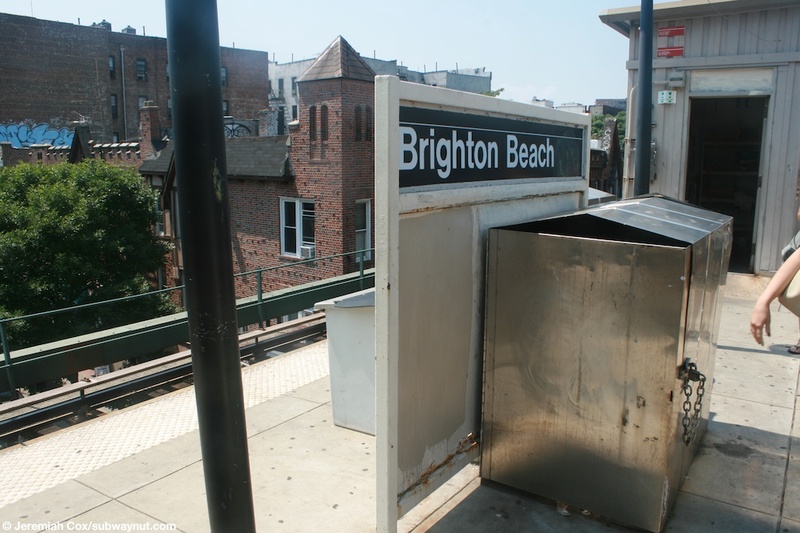 To reach the street after passing through the turnstiles there three staircases (two to the southside of the street and one to the northside) of Brighton Beach Avenue, just east of the corner with Brighton 7 Street, and the staircase opposite gets about mid-block to Coney Island. 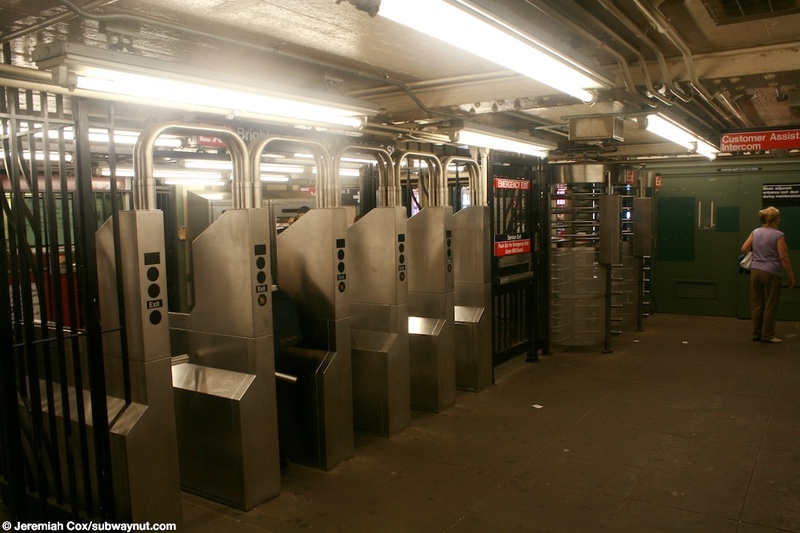 On the northern side of the street (where a fourth staircase should be) an escalator is provided to enter the subway only. It's in the standard type closed structure, and is only the width of one person wide, and is always running in the up direction. 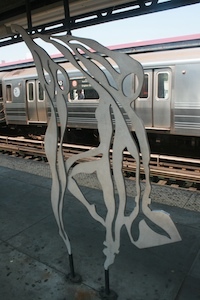 The station was given a renovation in the mid-1990s and all street staircases have extremely decorative little awnings on them at their entrances. 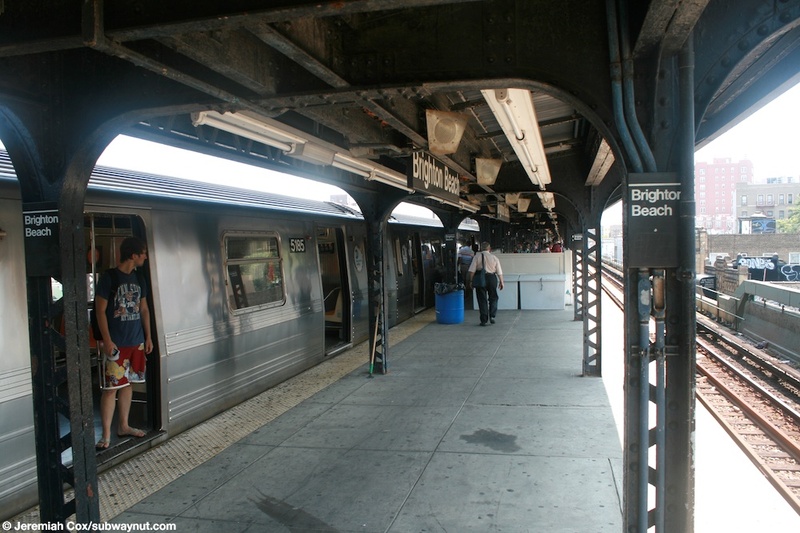 Both station houses seem larger than usual (that could also be because of the fact the line has four tracks, instead of the standard three for an el), and both have unusual looking interiors. The platforms are canopied for most of their lengths, between the station's two exits. 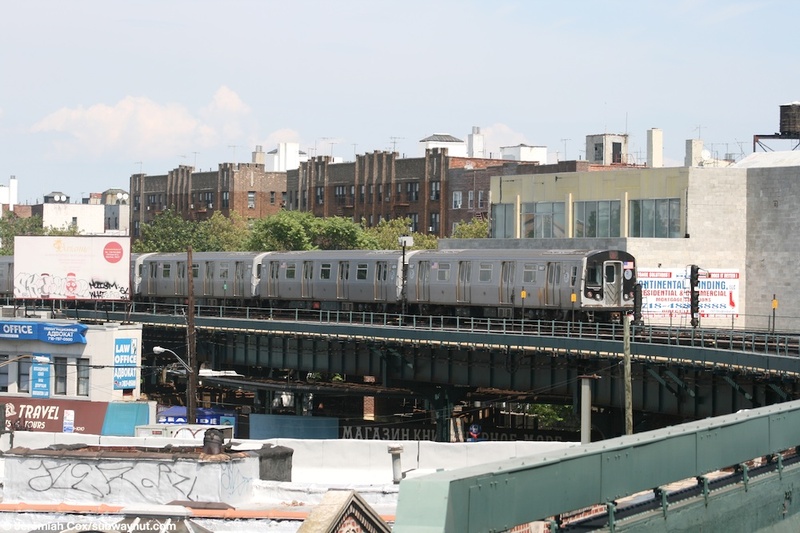 The northern (eastern) end of the station provides an excellent place to photograph trains curving off the Brighton Line's Private ROW and onto the el above Brighton Beach Avenue. 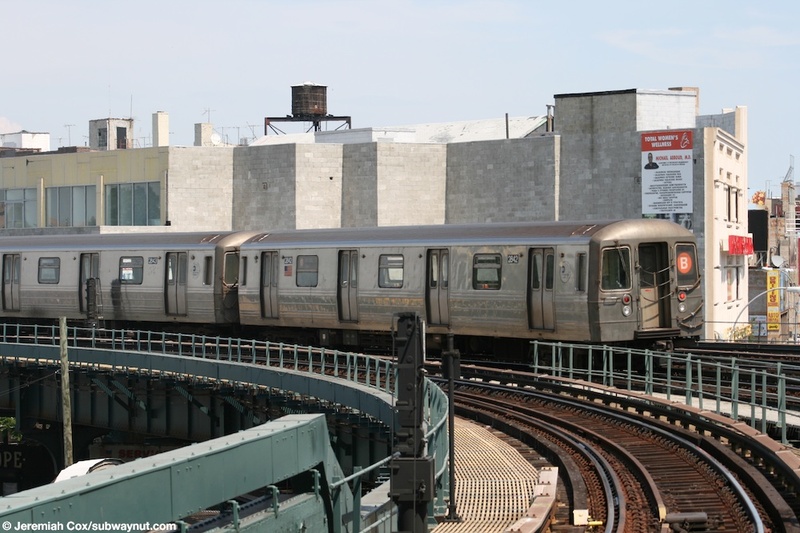 The station also has two buildings above it that provide various subway maintenance purposes. (brighton_beachb1) A Brighton Beach column sign on a metal beam that holds up the station's canopy. 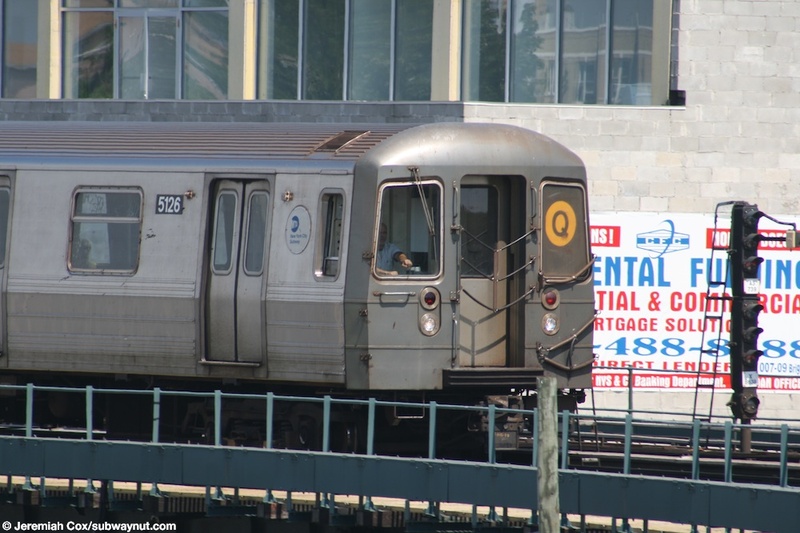 13 August, 2008 (brighton_beachb2) R68 #2842 and the rest of a B train leave Brighton Beach to begin another trip up to Manhattan and Harlem. 13 August, 2008 (brighton_beachb3) R68 #2842 has left Brighton Beach. 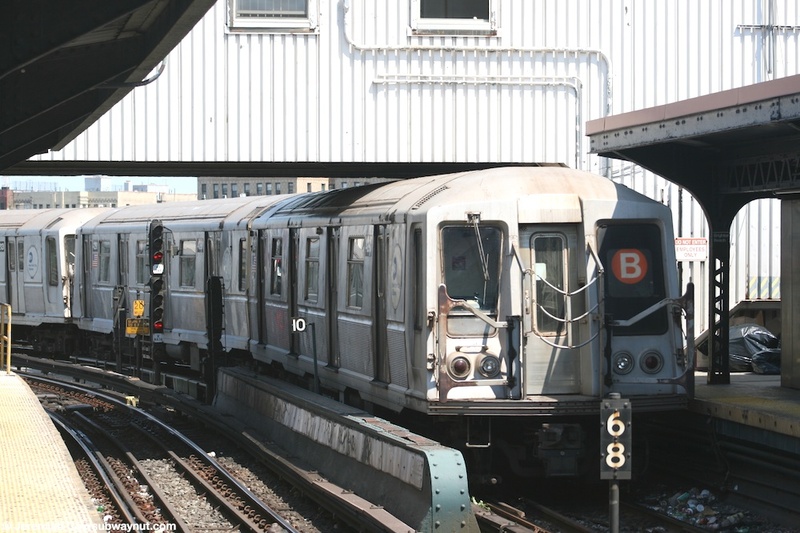 13 August, 2008 (brighton_beachb4) R160B #8807 and a Manhattan-bound Q train have curved onto the Brighton Line's private ROW after leaving Brighton Beach. (brighton_beachb5) R40-Slant #4290 and a Manhattan-bound B train begin to leave Brighton Beach and another trip up to Manhattan. 13 August, 2008 (brighton_beachb6) R40-Slant #4290 and the back of a Manhattan-bound B train have entered the Brighton Line's private ROW. 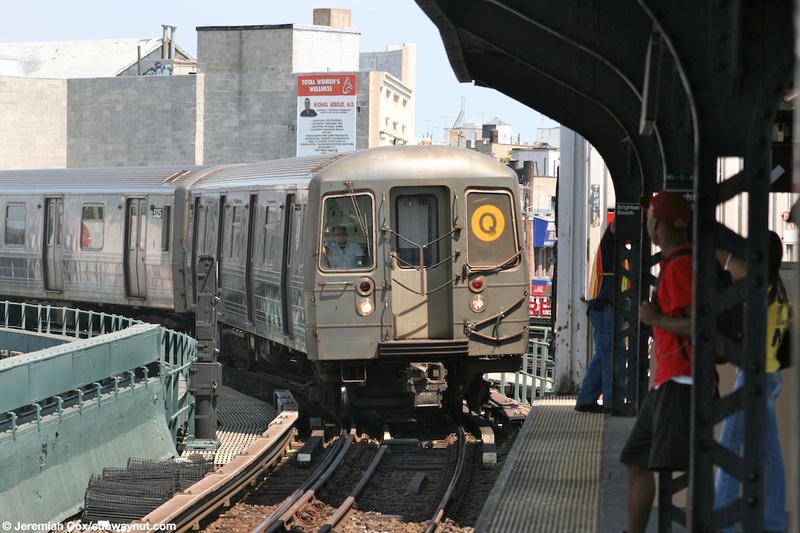 13 August, 2008 (brighton_beachb7) R68A #5126 leads a Coney Island-bound Q train towards Brighton Beach. 13 August, 2008 (brighton_beachb8) R68A #5126 enters Brighton Beach. 4 August, 2009 (brighton_beachb10) Looking down a platform at Brighton Beach. 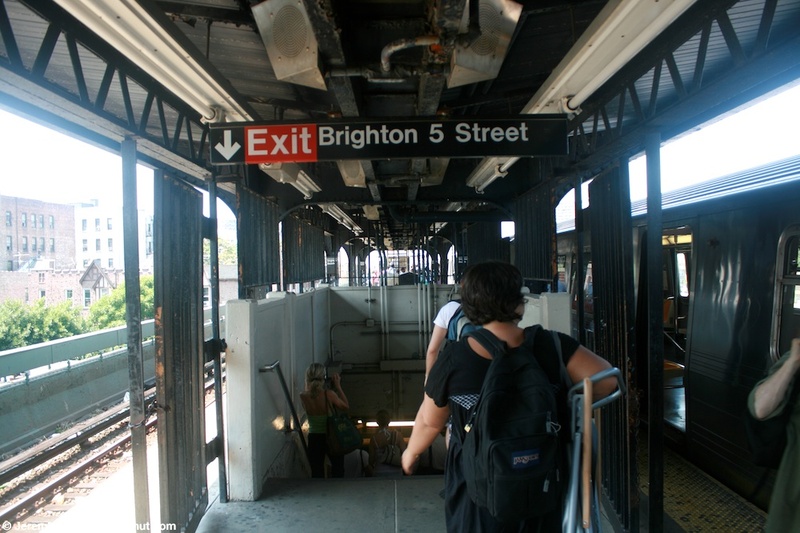 4 August, 2009 (brighton_beachb11) Passengers approach the single staircase down to the Brighton 5 Street exit at Brighton Beach. 4 August, 2009 (brighton_beachb12) The bank of turnstiles in the small station house at the part-time Brighton 5 Street exit from Brighton Beach. 4 August, 2009 (brighton_beachb14) A set of double doors out to one side of Brighton Beach Avenue. 4 August, 2009 (brighton_beachb15) The signage above a street staircase at a part time entrance to Brighton Beach. 4 August, 2009 (brighton_beachb16) All of the street stairs at Brighton Beach have a very unusual (probably restored BMT original) design with extremely decorative ironwork.